Jon’s Locks serves its Lincoln, Rhode Island clientele with a wide range of locksmith services. We feature fully licensed locksmiths that strive to meet all of the security needs of our automotive, residential, and commercial customers. From master keying to new lock installation, our services are backed by our experience and expertise. If you live in or around Lincoln, Rhode Island, Jon’s Locks offers affordable locksmith services you can rely on for your security needs. Jon’s Locks serves Lincoln, Rhode Island with a full spectrum of services designed for residential customers, commercial property owners, and car owners. Some of our most popular service offerings include lock repair and parts, key fob programming, mobile locksmith, lock re-keying, lock installation, master key systems, electronic lock installation, and more. Whether you’re buying a new home or business or need automotive keys, Jon’s Locks can provide you with all the services you need for optimum security. Some people try to save money by hiring a non-certified locksmiths. Working with someone who doesn’t have the proper credentials can compromise your security and even lead to damaged locks. Jon’s Locks offers affordable rates for our professional locksmith services. We take care to hire locksmiths that have the training, experience, and professional credentials needed to best serve our Lincoln, RI, clientele. We care about your security. Our locksmiths can also consult with you about best products, lock installation, repairs, and other security issues associated with our locksmith services. Don’t trust the security of your home, business, or vehicle to an unlicensed service. With our experience, you can rest assured in a job well done each and every time. Jon’s Locks features a real walk-in location where you can visit to consult with us about your security needs or engage our professional locksmith and key-making services. 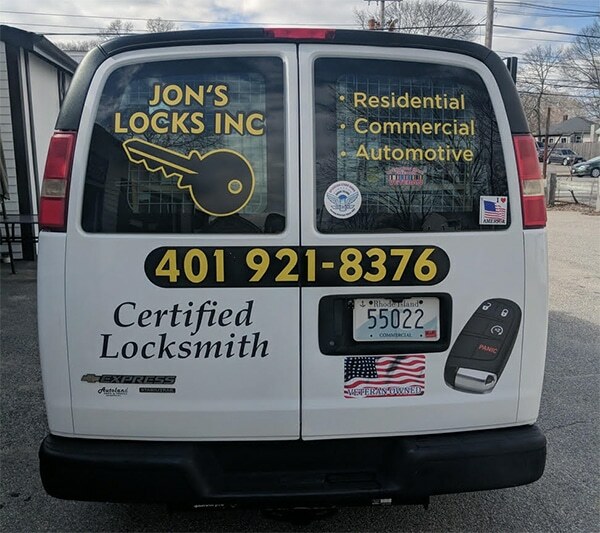 Located at 2291 W Shore Rd., Warwick, RI, 02889, Jon’s Locks is conveniently located and is staffed by locksmith professionals. We can work with you to find the best products to suit your needs. We sell and rekey these brands Schlage, Master, Kwikset, US Lock, BEST IC Core, Arrow, Detex. We have these proprietary keyways US Lock RXO Restricted Keyway, LT10, Schlage Everest. Because we stay up to date with best industry practices and products, you can trust us to provide you with the custom services you need to effectively protect your car, business, and home. If you need an auto locksmith, car keys, remotes, fobs, lock installation, and other locksmith services, be sure to contact Jon’s Locks. We routinely serve customers throughout the Lincoln, Rhode Island region. Jon’s Locks is a regional leader when it comes to high-quality professional locksmith services.